Vancouver's Chinatown developed in the late 1800's and is one of the city's earliest residential and commercial neighborhoods. Chinese pioneers and immigrants played an important part in the history of Vancouver; for example, from 1881 - 1885, 10,000 Chinese laborers were contracted to build the Canadian Pacific Railway, the transcontinental railway that would connect Vancouver--and British Columbia--to the rest of Canada. Today's Chinatown is both a bustling commercial district and an important historic center, a testament to both the history of Chinese-Canadians in Vancouver and of Vancouver itself. If you're staying in Downtown Vancouver, getting to Chinatown is easy: just hop on the Canada Line / Skytrain (Vancouver's rapid transit system) and get off at the Stadium - Chinatown station. Walk north on Abbot Street then east on Keefer Street and you're in the heart of Chinatown. You can also drive to Chinatown (there is metered street parking), or use the bus. Vancouver Chinatown is roughly bordered by Hastings Street to the north, Taylor Street to the west, Georgia Street to the south, and Gore Street to the east. 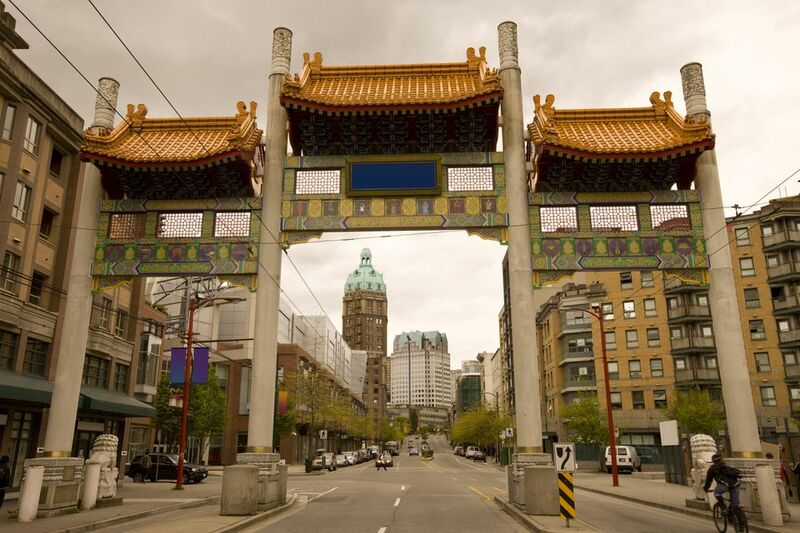 The Millennium Gate (junction of Taylor Street and Pender Street; pictured) is the grand "entrance" to Vancouver Chinatown. Created at the turn of the millennium, the Gate represents Chinatown's "Journey through Time" with a combination of Eastern and Western symbols. Tiny Shanghai Alley was the original center of Vancouver Chinatown, a fact commemorated by the West Han Dynasty Bell that sits in the middle of the alley. The world's narrowest building, according to the Guinness Book of World Records, is in Vancouver Chinatown: the Sam Kee Building (1 East Pender Street) is just six feet wide! The Chinese Cultural Centre (555 Columbia Street) was the first museum in Canada dedicated to Chinese history and culture. The Centre has an archive and a small museum dedicated to Vancouver Chinatown culture and history; its exhibitions highlight works by Greater Vancouver Chinese-Canadian artists. The can't-miss attraction in Vancouver Chinatown is the Dr. Sun Yat Sen Chinese Garden (578 Carrall Street), a bastion of tranquility in the heart of the district. There are both free and paid-admission areas of this garden to explore; I recommend paying for the full experience. (The free portion is rather like a free preview; if you like what you see even a little, you'll love the full garden.) This classical Chinese garden is one of the Top 5 Gardens in Vancouver. Shopping in Chinatown is largely focused on Chinese goods and imports, though not exclusively. The Chinese import shops run the gamut from high-end Chinese antiques to low-end souvenirs, toys, and gadgets. Overall, it's a great place to browse for home furnishings, small gift items, and Chinese fashion. Ochi (121 East Pender Street), a high-quality Chinese fashion boutique, with both modern and traditional styles. Bamboo Village (135 East Pender Street), a packed-to-the-rafters import shop with everything from lanterns and fans to antiques and calligraphy sets. Décor of China (122 East Pender Street), which specializes in higher-end Chinese antiques and home furnishings. Chinatown has plenty of Chinese groceries and Chinese medicine shops, too, which carry specialty ingredients and are fun to browse, even if you aren't planning to buy. In 2010, Condé Nast Traveler named Vancouver's Chinese food "the best in the world," better even than Hong Kong and mainland China! Today, most of that incredible Chinese food can be found in Richmond, BC (check out the Vancouver Chinese Restaurant Awards for the best Chinese food recommendations), but there are still a few stand-outs in Vancouver Chinatown. Gold Stone Bakery & Restaurant (139 Keefer Street) is a local favorite for its Hong Kong-style diner food and sweets, including egg tarts and sticky buns. Kent's Kitchen (232 Keefer Street) serves big portions of Chinese food with a small price tag. Floata Seafood Restaurant (180 Keefer Street) is a classic Chinese restaurant that hosts Chinese New Year celebrations and is most famous for its seafood and dim sum. Bao Bei (163 Keefer Street) serves up a contemporary twist on Chinese food in a trendy eclectic space. Sai Woo (158 East Pender) has a cozy dining room and is the best place to enjoy dumplings and other Asian fusion comfort food. Fat Mao (217 East Georgia Street) is a hip noodle house that is perfect for a rainy day. It's not Chinese, but Phnom Penh (244 E Georgia Street) is an acclaimed Cambodian and Vietnamese restaurant that locals love for its flavorful dishes and chicken wings. Chinatown has grown into a nightspot destination like Gastown and the Granville Street Entertainment District, and is home to two Vancouver favorites: the Keefer Bar and the Fortune Sound Club. The Keefer Bar (135 Keefer Street) is one of the Top 10 Cocktail Bars in Vancouver and has fabulous original cocktails that often use Chinatown-sourced ingredients. The Fortune Sound Club (147 East Pender Street) is one of the Top 10 Vancouver Nightclubs and the place to dance in Chinatown. Expect a good crowd--and sometimes a line at the door--on Friday and Saturday nights. Chinatown used to host the Chinatown Night Market on weekend nights May-August, but the Night Market went on indefinite hiatus in 2014. You can still experience Vancouver's summer night market tradition at the big, Asian-style night markets in Richmond, BC.